Dhaka, 1 August, Abnews: Prime Minister Sheikh Hasina today said Bangladesh Nationalist Party (BNP) does not believe in healthy politics as they only know how to harbour terrorism and militancy and commit corruption. “There is no doubt that the BNP is involved in terrorism and militancy and they’ve killed our many leaders and workers through these,” she said. The prime minister said this while addressing a function on the occasion of handing over savings certificates to the families of 25 persons, who were killed or injured in the August 21 grenade attack of 2004, at her official Ganobhaban residence here this afternoon. “This attack took place after this speech of Begum Zia and from this (speech), it’s understood that who were involved in the crime,” she said. “Whenever they gave such a speech, attempt on my life was made at that time,” she said and referred to the planting of two bombs, one weighing 76 kg and another 84 kg, at Kotalipara to kill her. “Prior to this, the BNP had said the Awami League would not come to power in 100 years … whenever they make such remarks, we understand that an attack is imminent on us,” the premier said. Twenty-two leaders and workers of AL, its associate bodies including the then Mohila AL president Ivy Rahman, wife of late President Zillur Rahman, were killed and over 500 others suffered splinter injuries in the attack and many of them became crippled for life. Though Sheikh Hasina narrowly escaped the attack, she lost her hearing ability due to the impact of the repeated grenade blasts near the truck-dais of the huge public rally. The premier said Awami League arranged the rally in front of the party office on August 21, 2004 for peace and in protest against terrorist activities of the militants across the country including an attack on the then British high commissioner at the shrine of Hazrat Shahjalal (R) in Sylhet. “We became victims of terrorism when we were going to stage an anti-terrorism rally,” she said. She said the killers swooped on us committing such a crime in broad daylight. The killers lobbed 13 grenades killing 22 AL leaders and workers including Ivy Rahman and injuring hundreds of leaders and workers. “I was saved by a human shield formed by our party leaders including Mayor Mohammad Hanif,” she said. 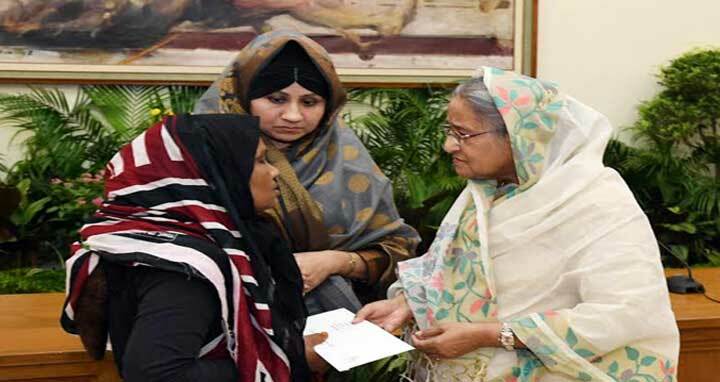 Sheikh Hasina said since the attack, she herself and her party have been continuing help to the August 21 grenade victims. “As much long I remain alive, I will continue to help them,” she said. The premier also sought assistance from all to build a hunger and poverty-free Sonar Bangla as dreamt by Bangabandhu.